It may be the most functional piece of nerd jewelry you've ever seen, and something you can actually get through airport security. Leatherman's origin story puts its founder in a situation where his standard-issue pocket knife couldn’t get his broken car back on the road, so he created the Leatherman multi-tool with an integrated pair of pliers. The design is often emulated, and for many it's replaced the old Swiss Army Knife as the tool of choice. 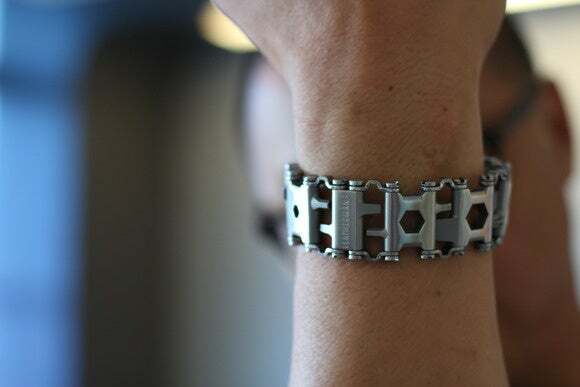 A new cateogy of multi-tool jewelry: Leatherman Tread. What makes the Tread different from the typical keychain or compact wallet “multi-tools” is its beefiness. I’ve tried a lot of different keychain and wallet multi-tools, and they all fall short in durability and usability. Usually made of very low-quality steel, I’ve actually had one shatter from dropping my car keys on the ground—an impact that broke the “tool” but didn’t hurt my keys. I’m fairly certain I could bend or destroy most watch bracelets by intentionally twisting them, but with the Tread, twisting it as hard as I could just resulted in divots in my hands. This doesn’t mean it’s indestructible, but it does mean you can really lean into the Tread and apply a lot more torque than you could with a cheaper tool. 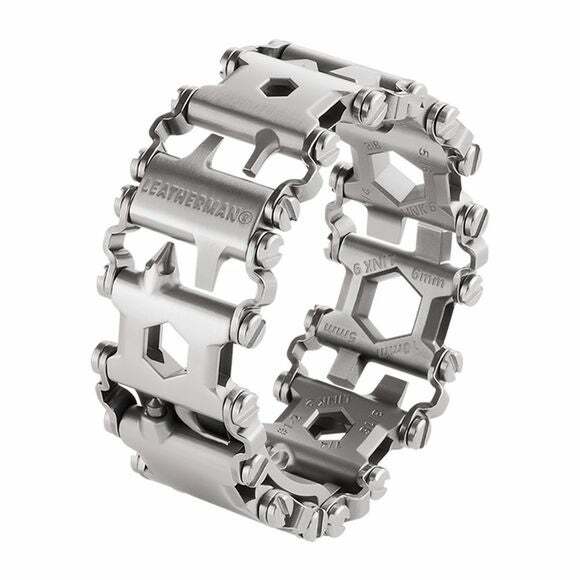 The Tread is also covered by Leatherman’s 25-year warranty. While most warranties are pretty worthless, Leatherman’s warranty reputation is fairly reputable out there. The Tread isn’t just for looks. You can really put some torque into it. Certainly a lot of the “29” functions of the Tread are just double- and triple-counting different sizes of the hex, Phillips, flat drivers and box wrenches but there’s a few you don’t expect, such as the carbide glass breaker or the bottle opener. There’s also a small pick that's actually made so you can pop the sim card out of a phone. The other side of it includes a blister-pack opener. It works: I easily sliced my way through some blister packs as though I were wielding a light saber. It’s safer than using my pocket knife, too. There’s even an integrated 1/4-inch socket drive. The idea is you’d have the Tread on your wrist and then pocket a couple of your favorite socket sizes. One issue I ran into early was the clasp getting inverted which keeps the Tread from closing. Initially, you'll think the only way to fix is to take it apart. You don't. You just to have flip the sim card pick over the 1/4-inch socket drive by fully extending it. Still confused? I made this handy animated gif to hopefully help you out of your situation. Perhaps the most unexpected function is the oxygen tank wrench. This feature probably caters to paramedics who may need to make a quick adjustment to the “oh two” of a patient when the oxygen wrench has gone sliding down the hillside of a car crash. These oxygen tanks, I’d imagine, require wrenches to set them rather than permanent knobs, to prevent accidental changes that could endanger a patient’s life. Pocket your favorite socket and the Tread works as an ad-hoc driver. Each of the links is clearly labeled. Removing them is fairly easy. Just grab a penny, insert it into the slotted head, and rotate counter-clockwise. Make sure you torque the screw back down when reassembling it, though. This is how you’ll adjust the size, too. Most of the links let you take out about a half-inch of slack, and one of the links lets you cut out a quarter-inch of slack. This is obviously a problem. On my 7.5-inch circumference wrist, I removed one link to get it to fit. That meant I had to choose just which tool I wanted to sacrifice. Each link is clearly labeleled. I personally like to wear my watches fairly loosely. If I had daintier wrists or liked to wear it tighter, I’d have to lose another link. As I’m not a paramedic, I lost the oxygen tank wrench, but that took with it the 3/16-inch and 1/4-inch hex drive. This led to some anxiety and worst-case scenario computations in my brain, where I’m sure I’ll now run into a situation where I need an O2 wrench to save my life. 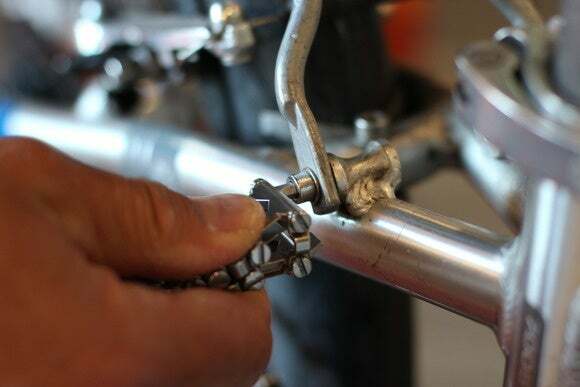 You may scoff, but for the kind of person that the Tread appeals to—always prepared—what good is the Tread if you don’t actually have the wrench you need? You’ll need thick wrists to get the most out of the Tread or wear it very loosely. 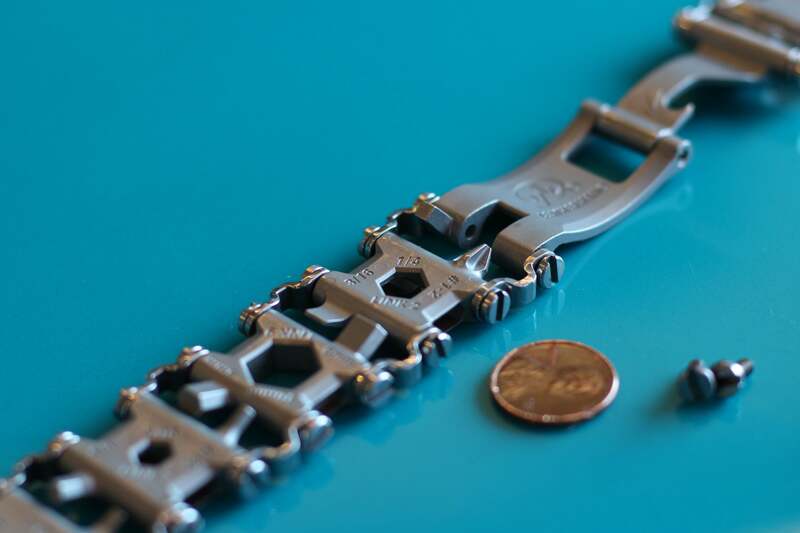 Leatherman actually has a watch attachment coming too, which initially seems like a great idea until you realize you’ll probably have to jettison two more links to fit it. With a small-enough wrist and the watch, it’s possible you’ll be down to just 10 functions on your wrist. That’s something you need to consider if you’re looking at the Leatherman Tread. I’d rather keep my Casio G-Shock (cause what else would a Tread wearer use?) and the Tread and the paracord friendship bracelet on my off hand. The other consideration is that the Tread, as nifty as it is, doesn’t offer anything the “real” multi-tool on my belt pocket does. The Leatherman Surge I carry daily, for example, does a hell of a lot more than the Tread can, if only because it has the signature Leatherman pliers, a knife, saw and file. But then, I can’t bring my Leatherman Surge, Wave, Benchmade knife or half of the other bits of flotsam and jetsam in my pockets or on my belt with me on a plane. The Tread, however, easily passes the TSA test as there’s no blade on it. The Tread on my wrist also won’t fly off or get lost, even during my freedom strip search. The other function the Tread serves is probably it’s primary function: jewelry. Sure, the Tread is functional, rugged and surprisingly strong. But what it mostly does is say something about the wearer and his or her outlook on being prepared for life. If you need a screw tightened, something cut or to borrow a flashlight to look for the keys you dropped in the server room, just look for the co-worker wearing the Tread, because he or she will be ready for anything. That’s really what the Tread does best besides actually working as multi-tool.